While big cities may get all the attention, New Zealand’s small towns are really what makes our country so unique. Here are five of our top picks for the perfect kiwi getaway location. These hidden gems are absolutely stunning all year round, and are perfect for escaping the noise, hustle and bustle of everyday life. Just take a short 20 minute drive out of Queenstown and you’ll find the picturesque little settlement of Arrowtown. Built on the banks of the Arrow River, this historic gold mining town is a perfect blend of New Zealand’s heritage and nature. 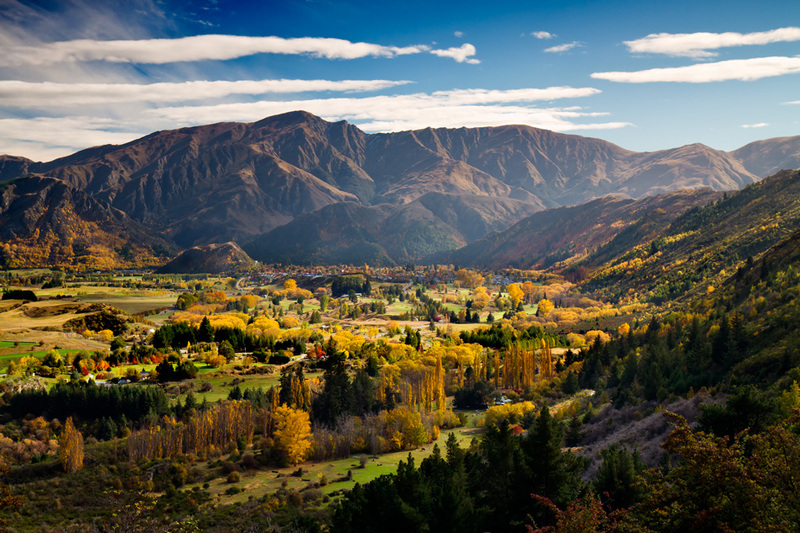 One of the main things Arrowtown is known for is its natural beauty. Whether it be the snow, leaves, blossoms or greenery, you are guaranteed a magical setting every season of the year. The annual Autumn Festival is a real highlight on the calendar, celebrating the colour and culture that makes this charming little town so special. Arrowtown is never in a rush either, so you are always free to enjoy everything in complete peace and tranquillity. This could include getting a taste for the unique dining options, going for a nature walk, or exploring the iconic the main street. Despite being located just 100 kilometres north of Auckland, Mangawhai feels like an absolute world away. This charming coastal village occupies a beautiful corner of New Zealand, crowned by the stunning Mangawhai Heads beach. With rich history, great food (especially the chocolate), and art absolutely everywhere, #MagicalMangawhai has all the ingredients for the ideal beachside town. All bases are covered when it comes to the water as well, as the waves are consistently perfect for the surfers, while the harbour provides safe swimming and kayaking. Don’t miss the Walking Weekend either, an annual celebration of Mangawhai life and getting outdoors in this beautiful country. There are 34 different walks to embark on exploring the beach, cliffs, bush, coastal and rural areas that Mangawhai has to offer. The walks are also guided by the locals, so you’re bound to make a friend or two along the way! In true Mangawhai style, the weekend is complete with plenty of food, wine, art and music. Situated on the coast of the Waikato region is the small yet world famous surf town of Raglan. Known for its beautiful beaches and laid back vibe, it makes for an ideal Central North Island escape. You can also soak in its stunning scenery with the area’s many walking tracks through beach and bush. Don’t just take our word for it either, Raglan was even judged to be “New Zealand’s Best Looking Town” by Lonely Planet guidebooks. If you’re more into catching waves, look no further, as Raglan is widely regarded as the surfing capital of New Zealand. Manu Bay (also known as The Point) is known for its long breaks stretching all the way down the coast. If you have the right skill level, it's possible to catch a wave and cruise for up to two kilometres. The dining scene in Raglan has also really taken off, meaning you are spoilt for choice when it comes to food and drink. There are now several high quality established restaurants based in the area, as well as plenty of vibrant cafes for that crucial cuppa. Another Northland gem, Matakana is located just 45 minutes north of the Auckland Harbour Bridge, not that you’d know it by the atmosphere. This stunning region really has everything, from boutique food and wine, art, nature walks, beaches, vineyards, and a village full of charm and character. Plus, what kiwi Saturday morning would be complete without a market? The Matakana Village Farmers’ Market is a must do. It’s a real foodie’s heaven, full of fresh & home-grown flavours, along with award winning coffee and live music right by the riverside. Back to Central Otago for our last stop, Wanaka. Known for its natural year round beauty and frosty temperatures, this small town is one of the South Island’s true gems. Perfect for the snow lovers, Wanaka has four ski & snowboard resorts: Treble Cone, Snow Park, Cardrona, and Snow Farm. Wanaka is also within touching distance of the unmissable Mt Aspiring National Park. Do yourself a favour and take a journey through the breath-taking scenery this place has to offer. From the majestic mountains to the river flats, it is an absolutely unforgettable experience. If you’ve got some extra time, why not try some of Wanaka’s other activities? There’s truly something for everyone, with jet boating, trout fishing, scenic flights and horse trekking all included on the menu.